Speaking of messes how about this race for the sixth AFC spot? It ain’t often that the biggest win comes from not playing, but them Jets and Browns, sitting idle for the bye really, really benefited from an atrocious week from their competitors. The Titans losing to the Jaguars, the Chargers dropping their second straight, and the Dolphins losing to the woeful Buccaneers. The Ravens got a bump from a win over the Bengals, the only question for Baltimore is whether it will be a serious turn around for the Ravens or just a dead cat bounce from all the other sucking going on in the AFC Wild Card race. 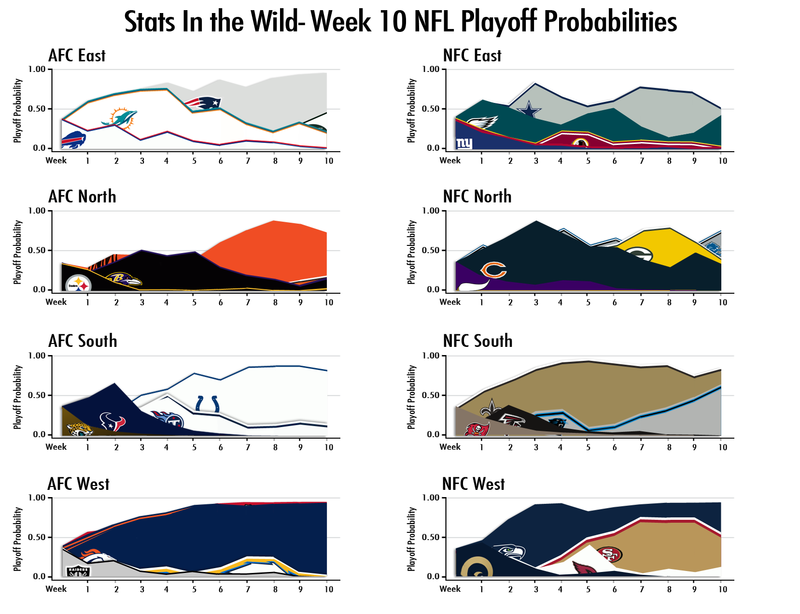 Looking forward to Week 11, Broncos/Chiefs doesn’t really affect the races, only who has a shot at home field advantage (as will their second game in week 13.) With the Cowboys on bye, the Eagles get to play poor, poor Washington and can take the reins in the NFC East. The Packers and Lions both play crappy teams, and if this season has a theme it’s “which team will fall on their face against the much worse team.” The Saints play the Niners while the Panthers play the Pats, so neither has that easy of a game ahead of them. The Jets get the Bills, so they should win, and probably won’t. The Browns play their division leaders, so I assume they’ll lose. The Titans play the Colts, so that won’t be easy either. So, for the betting public, bet on teams that seem good to lose against the teams that should not win. Unless this week, the teams that should win do win. Then bet that way. Or be extra safe, and bet on both teams. YOU LITERALLY CANNOT LOSE THAT WAY! Posted on November 13, 2013, in Uncategorized. Bookmark the permalink. Leave a comment.